Ready or not, Christmas time is fast approaching! It has been tradition in my house to decorate for Christmas the weekend before Thanksgiving, it just fits the best with our busy schedule. When my daughter was 2 and my son was 6 months old, I started hearing about this ‘Elf on a Shelf’ thing. I looked into it and I thought it was the perfect tradition to start with my family. 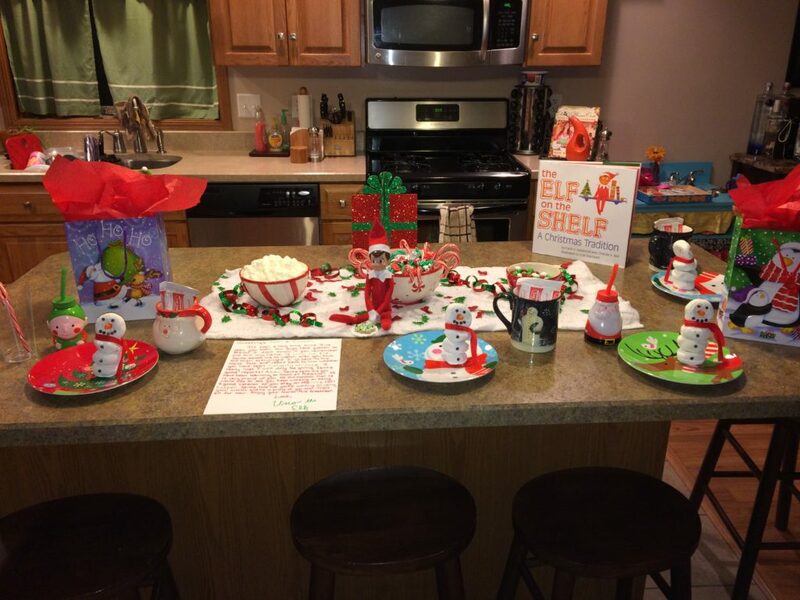 I knew right away I wanted to do a special breakfast when our elf arrived. That first year (6 years ago now! 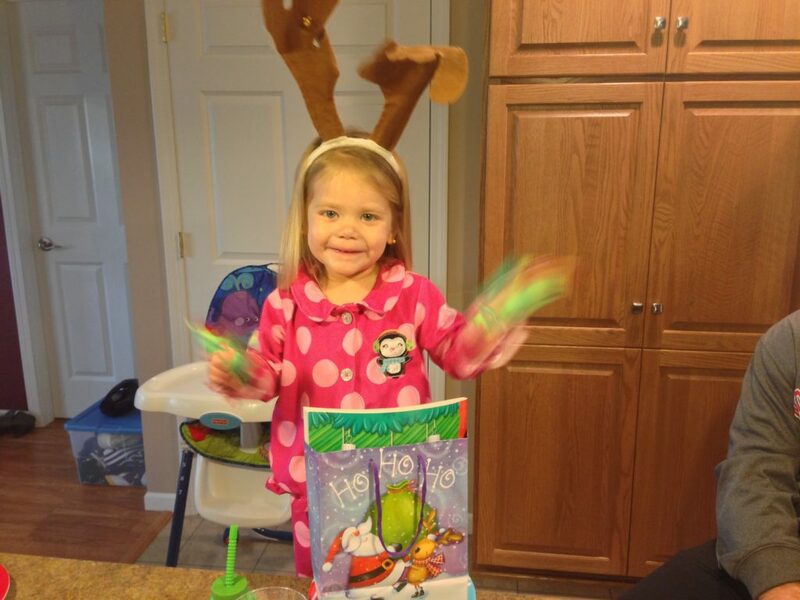 ), I was up late putting everything together but the look on Abbi’s face that morning was priceless! In terms of the food, sometimes Uno (our elf), has breakfast put together and it’s sitting out when the kids wake up. Other times, it is in the refrigerator or still other times, Uno sends me a picture on my phone or leaves written directions on how to make the main course. 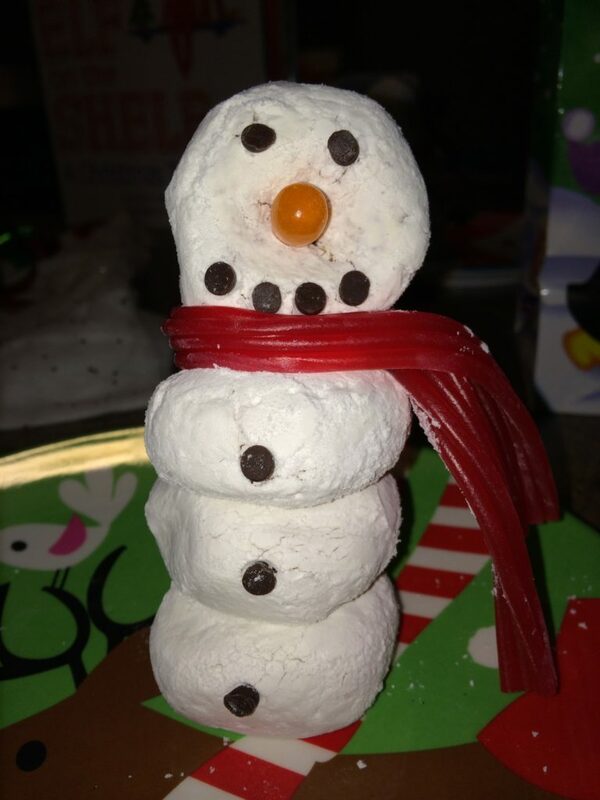 The powdered sugar donut snowman was made with powdered sugar donuts, mini chocolate chips, pull n peel licorice and an orange Mike-n-Ike nose. 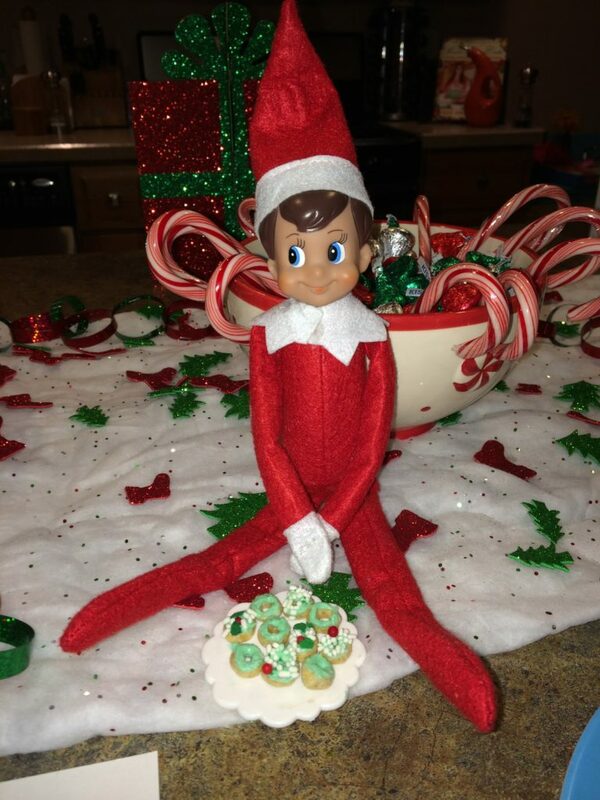 Uno also brought himself some elf donuts that year (Cheerios with frosting and sprinkles). He brought reindeer donuts another year. 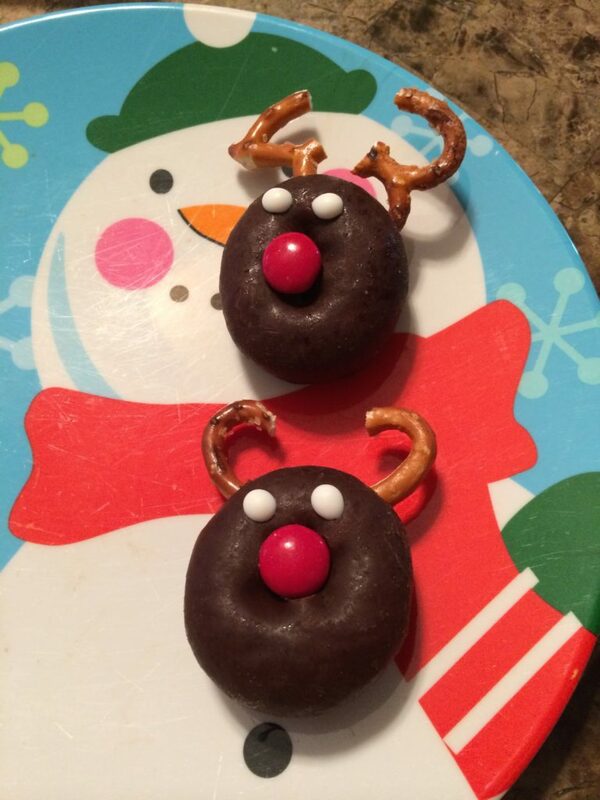 They were made with chocolate covered donuts and broken pretzels for the antlers. And then he started to get a little more creative with what to serve for breakfast. He texted me a picture and asked me to make these and left the ingredients. 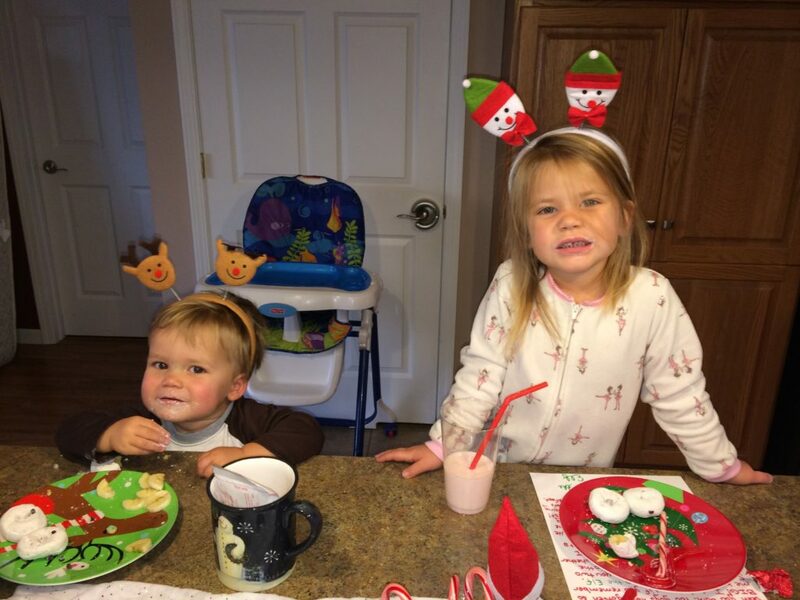 I had to make up these Rudolph pancakes but they did turn out so incredible cute! 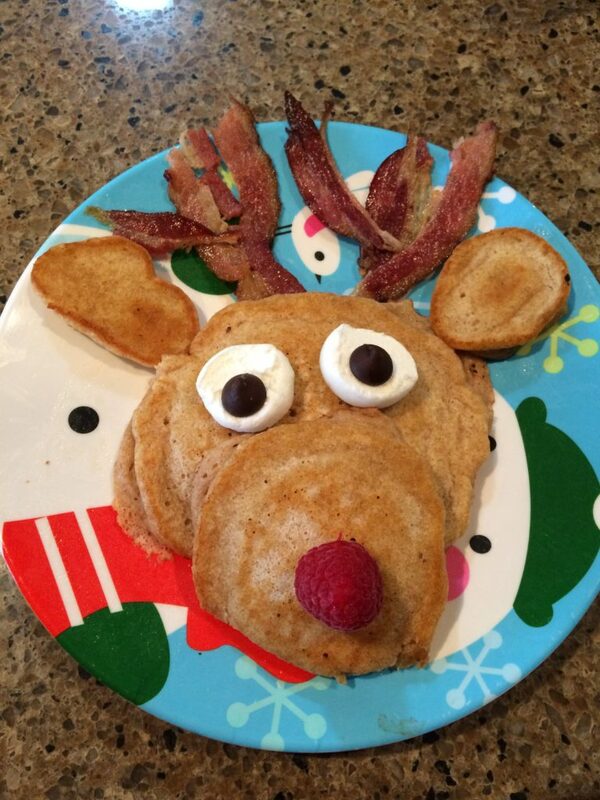 You just get creative with the shapes of your pancakes, use bacon for antlers, half a marshmallow and a chocolate chip for eyes and a red raspberry for his nose. 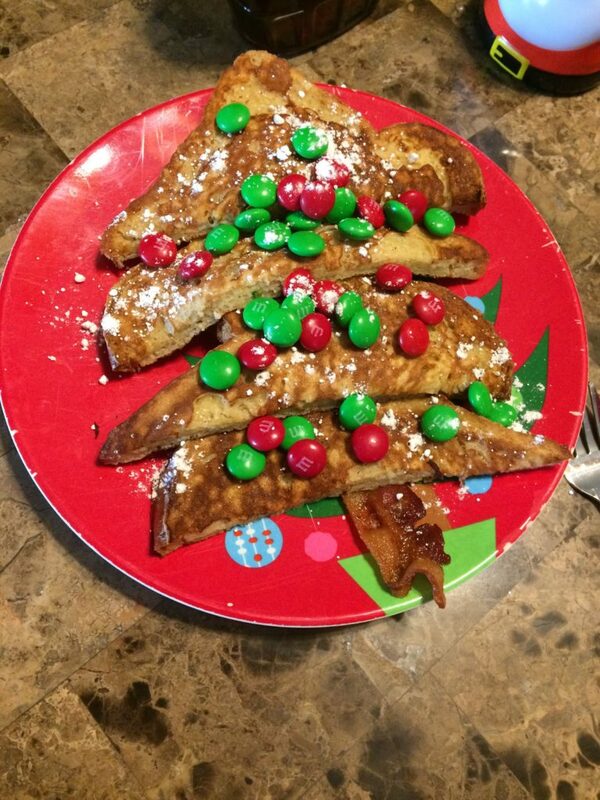 Christmas tree French Toast was also another one I made with the ingredients he left. 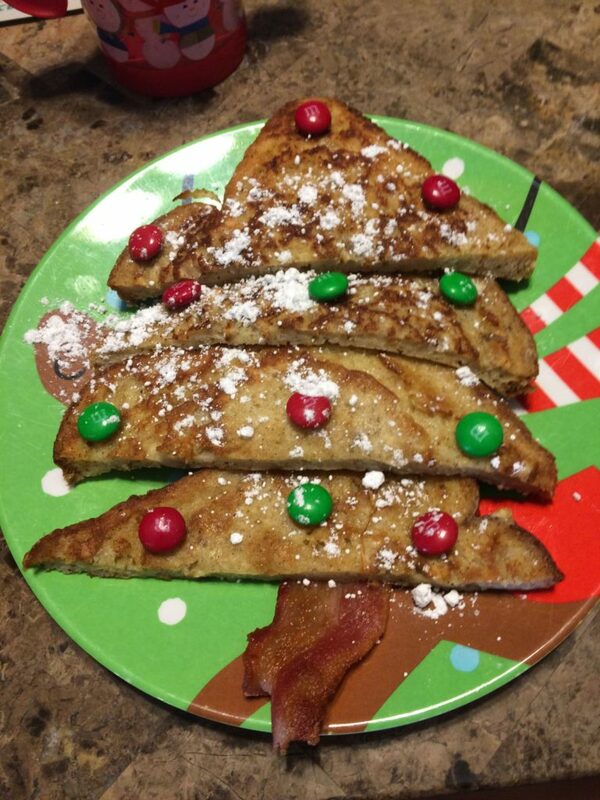 You simply cut the toast in half and layer them with a piece of bacon as the trunk. I dusted the trees with powdered sugar for snow and let them decorate their own tree. As you can see, one of my children likes M&M’s much more than the other! 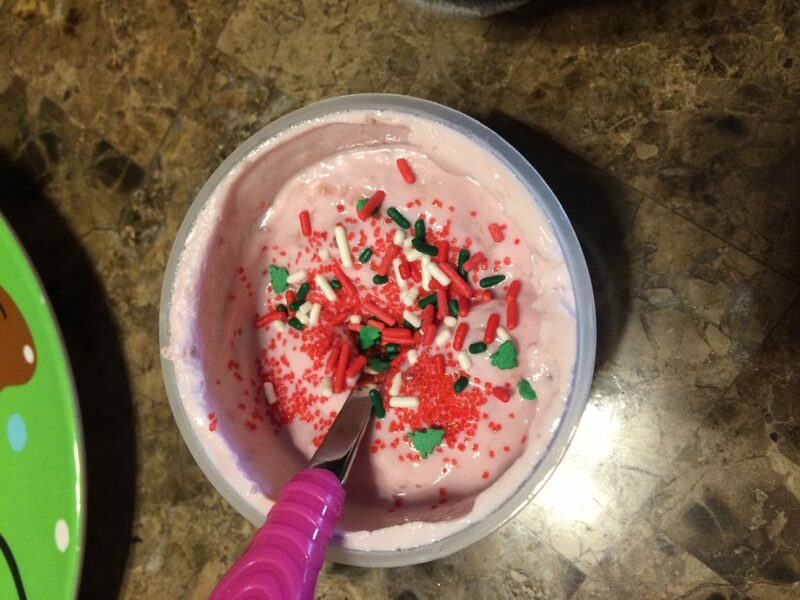 Strawberry yogurt with sprinkles has also been a hit. In terms of staples for the table, I always have our mugs out for hot chocolate with a bowl of marshmallows. I will typically also have some kind of sweet/chocolatey treat out as well like Hersey’s kisses and candy canes. 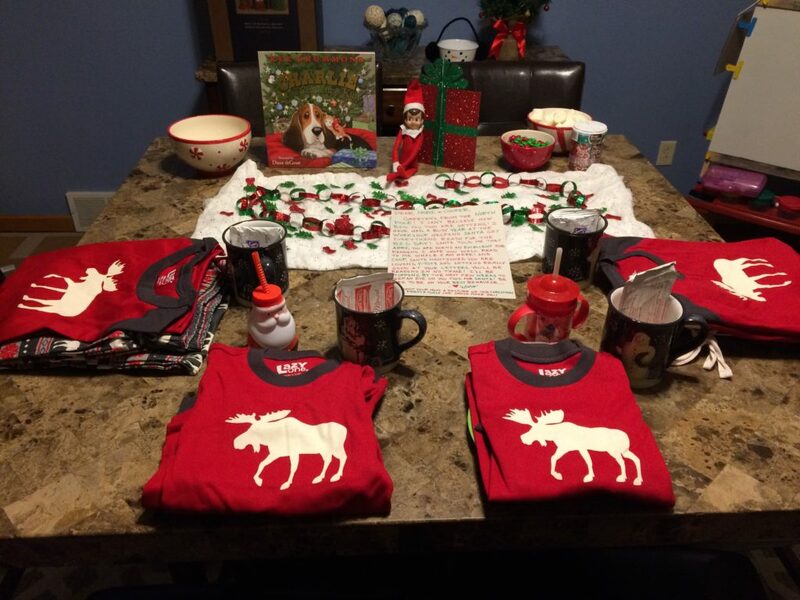 Since elves come to us from the North Pole, ours usually bring a little something with them. Christmas PJ’s are so fun and in the beginning, Uno (our elf), only brought pajamas for the kids, but recently he has been bringing them for the whole family. Last year he even brought a matching nightgown for Abbi’s American Girl doll! My kids LOVE watching Fixer Upper so I asked Uno to bring these pajamas from Target this year. 😉 He also usually brings a Christmas book that we can read together and one small activity or craft or last year it was slippers to go with their PJ’s. 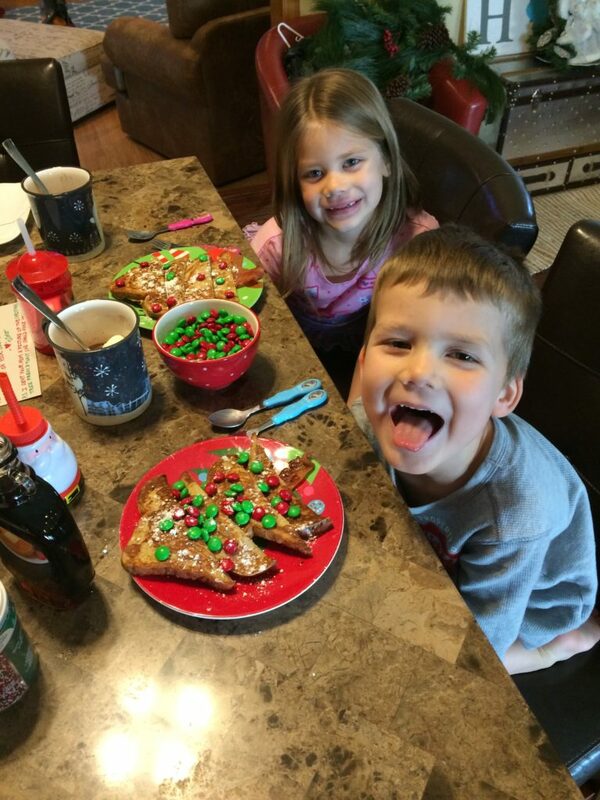 The North Pole breakfast has always been a great way to kick off the holiday season in our house and I hope it can be a fun tradition at your house as well!